You’re a contestant on a Content Marketing Game Show and you see three marked doors. Behind each door is a content marketing position. Is your dream job behind one of these doors? Let’s see. Door No. 2: Acme Accounting! Door No. 3: ABC Plumbing! With Door 1, you get to tell customer stories about the Apple Watch, iPhone, and Apple TV. 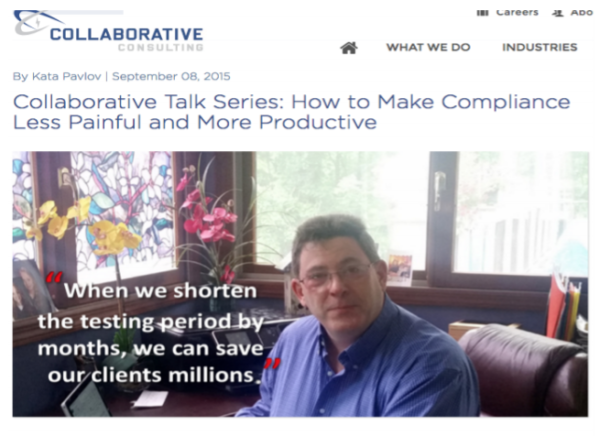 With Door 2, you create content about forensic accounting – a topic that’s boring and complex for most. And with Door 3, you create content marketing for a service that’s undifferentiated. If I polled 100 people, more than 95 would choose Door No. 1. But guess what? Content marketers can drive meaningful impact with the jobs behind doors 2 and 3 as well. Jonathan Kranz covered how to make doors 2 and 3 work in his Content Marketing World presentation, Nightmare Marketing: How to Create Content for the Boring, Complex, and Undifferentiated Stuff that Scares the S@#t Out of Everybody Else. If there’s a customer need for your product or service, then boredom is relative. While forensic accounting may bore most people, it serves an essential need for customers in the right situation. While forensic accounting may not inspire the imagination, it can certainly capture interest. Your job is to do just that. A conventional approach is to describe the different models and their capabilities. You list which model is the best fit for particular scenarios. But what if you raised the stakes? 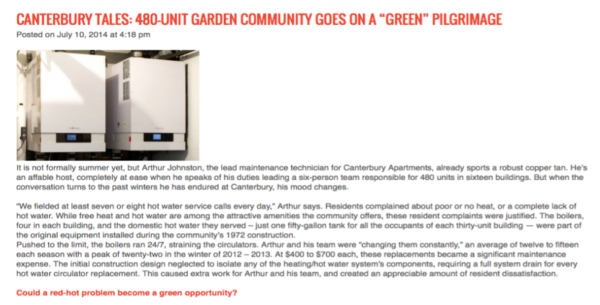 Creatively labeled “Canterbury Tales,” Veissman told the story of a garden community called Canterbury Apartments, where a six-person team was responsible for 480 units across 16 buildings. According to Arthur Johnston, lead maintenance technician at Canterbury Apartments, his team fielded seven to eight hot-water service calls per day. Residents complained about the lack of heat and hot water. The boilers were the original to the community’s 1972 construction. The boilers ran 24/7, straining the electrical circulators. As a result, the maintenance team had to replace 12 to 15 boilers each season. Each time a boiler is changed, a full system drain is done, which leaves people freezing cold. The team makes repairs at 2 in the morning as residents lie awake in the freezing cold. Now, are the stakes high enough for you? Pinnacle Strategies is “a global authority on operations and supply chain management.” According to Jonathan, Pinnacle Strategies seemed to have exhausted its opportunities in e-books on supply chain management. In this case, Jonathan recommends a tactic he calls “news flash” or tying your brand to something (e.g., an event) that people know. In 2010, the Deepwater Horizon oil spill occurred in the Gulf of Mexico on a prospect operated by BP. 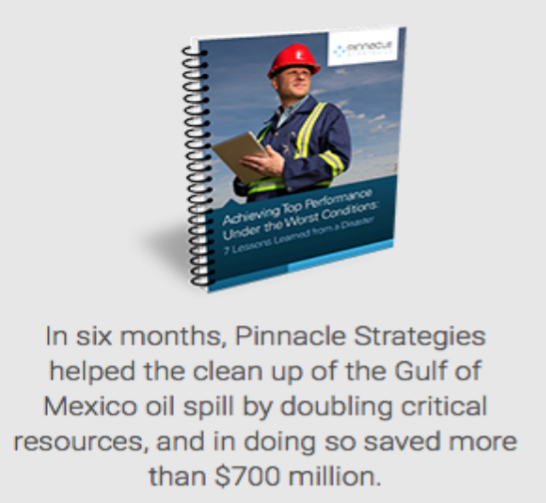 This offer provides a nice one-two punch for Pinnacle Strategies: It associates itself with the cleanup of a well-known spill and helped save $700 million in the process. 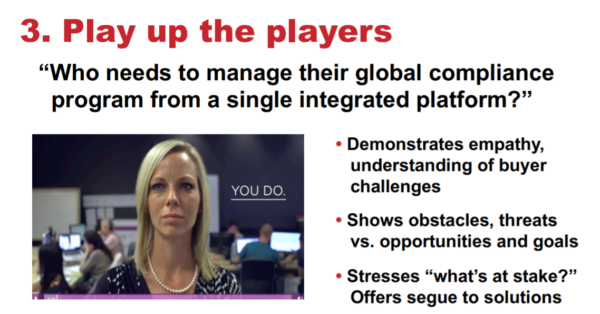 In a tactic Jonathan calls “play up the players,” Convercent shifted the focus away from compliance and toward the people for whom compliance matters. In other words, it made prospective customers the hero of the story. “Hitting” prospects with a 400-page e-book on how to rework their network architecture is overkill. It’s better to sell one salient fact or benefit of optimizing their network. While Jonathan agrees with this approach, he notes that a few adjustments are needed for complex products. In the solution section, get into customers’ heads before you get into their wallets. “Your job is to create a word picture so compelling that readers imagine themselves within it unconsciously. Just as you do when you read a precise story, you’re suddenly there, you’re in it,” Jonathan says. In the results section, use the voice of your customers to tell the story. If you detail the results yourself, it’s self-serving. But if you use customer quotes? It’s much more powerful, Jonathan says. How do local plumbers get their feet in the door? With a free magnet stuck to refrigerators. “A pipe bursts in my home. I don’t have a whole lot of time to go fussing around to find a plumber. If I can just look up at the refrigerator and there’s the phone number, bless you, I’m going to call that number,” Jonathan says. Once the emergency job is complete, the plumbers can take on the homeowner’s larger projects such as kitchen remodels, new heating systems, etc. See the ROI of that simple magnet? 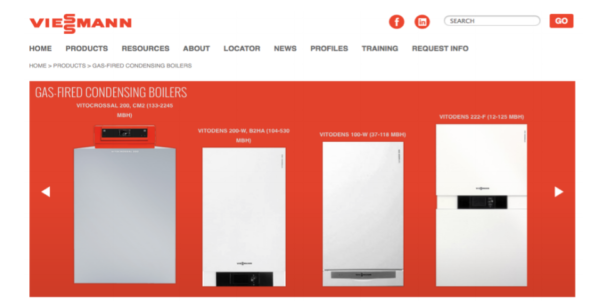 Jonathan encourages B2B companies with complex products to find their plumber’s magnet. “Create something that represents an easy starting point for engagement so that you don’t have to sell the whole kahuna to them all at once,” he says. Jonathan gives the example of Executive Benefits Solutions – its plumber’s magnet is free modeling tools to estimate benefits packages. On the one hand, experts may be too deep in the field to be adept at simplifying complex concepts. On the other hand, you can extract the knowledge of these experts and shape it in a way that’s most useful to your audience. Jonathan does this by interviewing experts. Instead of publishing the literal transcript, however, he curates the material and moves some pieces around. “It’s the authenticity of a real voice and yet you still retain control. This is a fantastic content opportunity,” he says. “I ask all kinds of questions during the process. What I did was take the best stuff that this expert had. I put it in what seemed like a logical, reasonable order, and then I inserted questions that would naturally transition to what he had to say,” Jonathan explains. In a sea of blue, how do you present your brand as red? Jonathan provides three tactics on how to differentiate products in an undifferentiated or commoditized industry. In an undifferentiated market, products are perceived as the same. However, you can be unique in how you create or deliver your product, which, in turn, can be the differentiation. Jonathan gives the example of Cityspan, which describes itself as “a complete system for recording participant information, tracking enrollment and attendance, and measuring outcomes.” Cityspan has competitors that provide equivalent offerings. While the products themselves are similar, Cityspan is unique in its delivery. “They promise you that before they deploy software, they’re going to spend lots of time talking to you and digging deep. Better still, they’re not going to give you one prototype. They’re going to give you multiple options for you to choose from,” Jonathan explains. New laws or regulations that affect your industry can create differentiation in an undifferentiated market. That was the case for eSignLive, a provider of e-signature solutions. The company is based in Canada, where it also manages data centers. The Canada data centers gave eSignLive an advantage in that country — and, the data centers in Europe gave them an advantage when the European Union rolled out the GDPR regulations in 2018. “eSignLive has an advantage because they’re going to keep all the e-signature data in the country of origin. They have the distributed databases and data centers,” says Jonathan. eSignLive doubled down on this fortuitous timing with marketing campaigns that emphasized its competitive differentiation. When your industry zags, you stand out by zigging. Several years ago, there was a lot of buzz around the bring-your-own-device (BYOD) movement – employees were bringing their personal devices (e.g., smartphones, tablets, laptops) into the office and using them for work-related activities. Symantec didn’t stop there. Once it attracted attention by zigging, it needed to demonstrate why others should follow its lead. 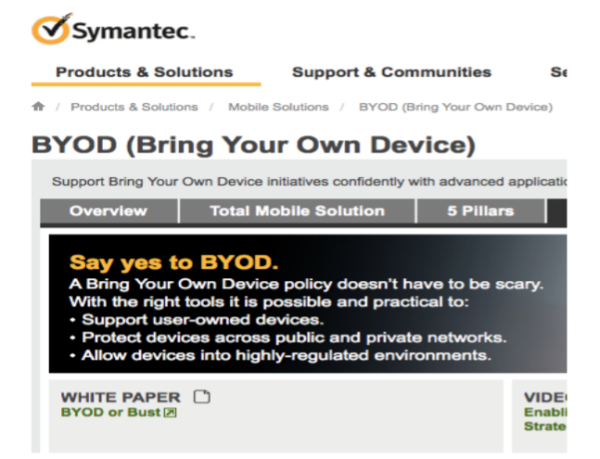 As seen in the image above, Symantec encourages a “say yes” to BYOD so long as companies have the right tools to implement it properly. By doing so, Symantec was able to stand out among the competition. Creating content for boring, complex, and undifferentiated products can be fun after all! I saw a pattern in Jonathan’s approaches – reframe the scenario and help your audience (e.g., prospects) think differently about you. Whether it’s raising the stakes, focusing on process over product, or being a contrarian, you have the opportunity to shape the narrative for any product, service, or industry. What boring, complex, or undifferentiated products are you responsible for marketing? And which of Jonathan’s tactics resonated the most with you? Share your thoughts in the comments. Catch some of the hundreds of experts speaking at Content Marketing World 2019 this September. Register today using code BLOG100 to save $100.